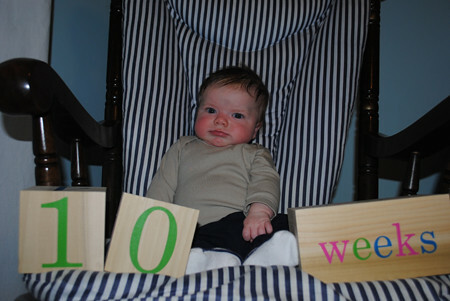 It’s hard to believe that Lucas has been in our lives for 10 whole weeks. And I have to return to work in less than two weeks. I know I’m repeating myself a lot on here, but I really can’t get over how much easier things get week after week. Last night, Lucas slept 7 straight hours. SEVEN. I put him down at 10:30 and he woke up at 5:30 this morning. It was perfect timing since I had to be up at 6 to get us ready before my 8 a.m. dentist appointment. 8:30 or 9 – awake time. Sometimes nap. 10 or 10:30 – eat. Then go to sleep. The goal is to have him down early enough for me to get to bed before 11 p.m. and I can say that this week I’ve managed to get to bed by 11 just about every night. Some nights it’s 10:55, but that’s by 11 and it doesn’t take me long to fall asleep. His naps are hit or miss. Some days he’s all for them (like today.) Some days, notsomuch. 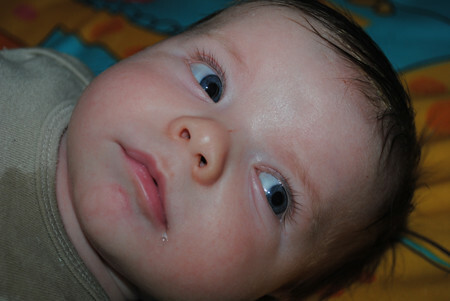 Check out his eyelashes…and the wet spot from spitting up. Other highlights from the past week….We’re soclose to being in the next size diaper. We realized yesterday that one of the diaper cakes we received was actually made of size 1 diapers, not size 2, so we’re hurrying to use those. He weighs about 13 pounds now. 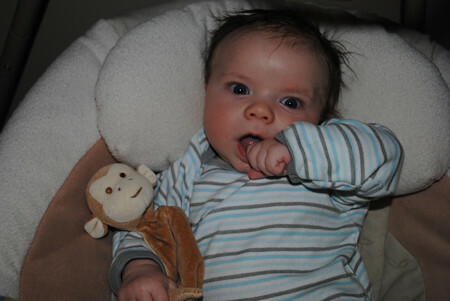 His 0-3 month clothes are starting to get a bit snug, and I’m phasing some out. I haven’t mentioned before, but he has some pretty serious cradle cap. We’ve been treating it with baby oil, and dandruff shampoo once a week (per doctor’s recommendation) and it’s getting somewhat better, but not perfect. It looks pretty rough, but doesn’t seem to be bothering him. His reflux is still pretty intense, but as long as he’s propped up after eating, it’s not always so bad. I’m still not eating dairy, spicy foods and lots of other things like garlic, onions, etc. It’s a pretty boring diet. I haven’t had a diet Pepsi since August 30. That’s saying a lot for me. No caffeine. I really haven’t had any soda recently. I can’t say that I’ve even had the chance to miss it! I have several videos that I’d love to share, but I realized tonight that they’re saved to the camera and not the card, and I can’t figure out how to move them to the card. I have to get the instruction manual out! Sorry for the long update. 🙂 I just started rambling, and couldn’t stop! So cute! His eyelashes are so long! !